You might think that spending time in the garden with small children is a little too dirt-sprinkled or boring, but the great outdoors provides lots of opportunities to learn about the natural world and where we fit in. It’s also the perfect way to de-stress, create something beautiful and spend some super-rewarding time together, screen-free. 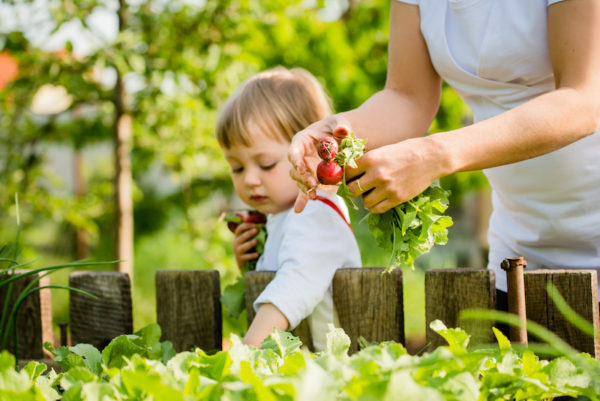 There are plenty of other developmental benefits for kids when it comes to spending time in the garden. Physical activity, a sense of responsibility, nurturing curiosity, imaginative play opportunities, exploring all kinds of science-based concepts and discovering more about nutrition and the natural world are but a few. Who could resist? Why aren’t you reading this in the garden with your child, right now?! 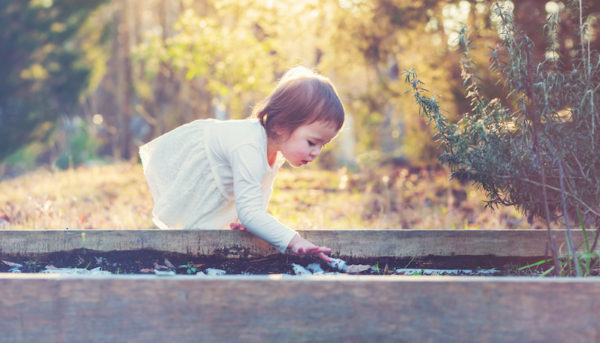 Investing in some child-sized garden equipment will help keep little gardeners busy and safe. Here’s ten ways to encourage a green thumb in your under-five kiddo, in case you’re itching to get started. Grow the kind of speedy veggies that your kids will enjoy raising and eating. Pots of salad leaves, bushy cherry tomatoes, established strawberry pots, mild and fast-growing radishes, baby carrots, peas, beans and herbs could all be grown in tubs or garden beds and your littlie will not only love watching them thrive, but may even be happy to pick, wash and eat them! 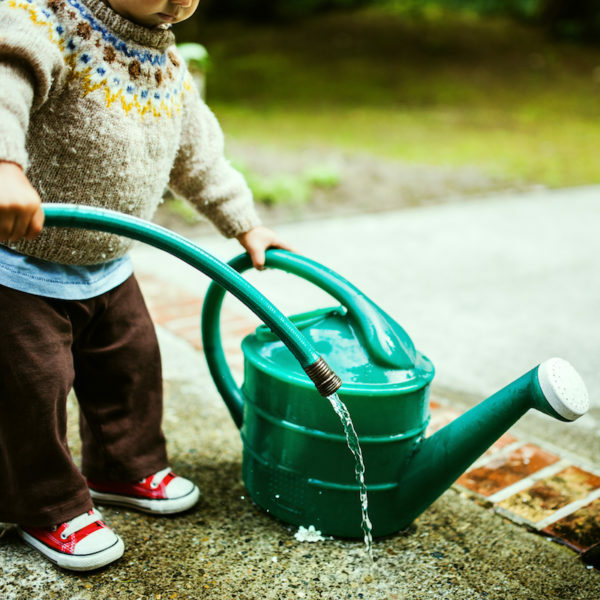 Arm your child with a watering can and point out the thirstiest plants, then let them get on with the important job of watering the garden for you. Repeated trips to refill the watering can are a must! Fairy gardens are perhaps on the back burner now that kids have access to iPads and cable TV. Introduce your child to the delights of making their own tiny and magical garden with things salvaged from the backyard. Keep an eye out for fairy garden friendly props (think mini figurines and plastic toys) at your local op shop too. If your own backyard is small or non-existent, you might want to introduce your child to the delights of gardening on a larger scale. Head to your nearest berry farm or road trip to a more rural area and seek out roadside veggie stands to inspire conversations about growing, eating and the natural world. Perhaps you remember growing grass heads or sprout heads when you were a child? This is a lovely activity to tackle with your own kids and they’ll have a lot of fun adding character to their critters (and giving them funny haircuts!) This activity is also perfect for apartment dwellers who don’t have access to backyards or balcony gardens. Here’s how to DIY your own growing friend. Your local nursery is a wealth of information about what to grow where, and your child will adore tearing up and down its leafy aisles. Talk to nursery staff about fauna attracting plants and go on a bee hunt with your child, noticing which plants are the most bee friendly and pondering how important these tiny creatures are to the natural order of things. Grab some pencils and paper and head outdoors for a nature study together. Notice the shapes and colours of plants. Draw your favourite flowers together. Take notes on the birds you might see. Talk about the weather. Granted some of these toddler notes might be a bit abstract, but you try describing the fragrance of a nasturtium leaf! Create a journal for your nature notes and continue to add to them when you’re both in the mood. What better way to appreciate the garden than to eat dinner outside or enjoy a backyard picnic lunch? You can take this next-level by eating things you’ve GROWN in the garden, or you can eat the kinds of things you’d like to grow and discuss where you might plant your own delicious veggies. Under fives love nothing more than to be offered a bit of independence and their very own garden bed is the perfect way to do that. Help them prepare their bed nicely and choose plants to grow. Have a daily watering ritual to ensure best results. You could even make plant markers together, to cutely label what is growing where. Introduce a composting system if you don’t have one already (your local council can often help with this) and grow disgustingly good stuff to dig into your garden. This is a great way to help kids understand the importance of reducing waste, recycling and nurturing wriggling worm pals, too! To keep your child safe in the garden, remember to supervise them at all times and be aware of any hazards or escape routes. Avoid using potting mix unless using gloves and mask. Make sure kids are carefully supervised around buckets of water, ponds or pools. Wear sunscreen, sun smart clothing and hats.